We all know how stressful traveling can be. Furthermore, keeping track of documents, tickets, cash, credit cards, and also other items without a travel wallet only compounds this chaos. You're probably also thinking 'where is a safe place to keep my passport?' However, did you know that things don't have to be this way? A travel wallet mitigates the stress of handling money and identification while crossing international borders. This functional, yet practical travel accessory allows for organization, and in many cases, security. Thus, the travel wallet is less of an accessory and more of a necessity. With this in mind, don't get caught fumbling all of your belongings throughout your journey! We've broken down three common types of travel wallets and given recommendations for the best of each. The chart below displays the best travel wallets of the year, along with their ratings. Click "See Today's Price" to see the current price for each travel wallet. While some of these features are considered standard, you will want to read the fine print and specifications of each product. Depending on where you plan to travel and particularly, the atmosphere of the locale, minor adjustments will get you the product best suited for your trip. Regardless, any combination of these features assists in making the trip from Point A to Point B a breeze. Who would have thought that travel wallets came in so many styles, materials, colors, and more?! We've compiled the relevant information about our favorite travel wallet types, questions you should ask yourself, and specific features to consider before taking the plunge. A money belt, or belt wallet, is a great option for keeping essentials next to your body and on your person at all times. With various sizes and multiple pockets, it is almost surprising how much you can carry in a money belt. 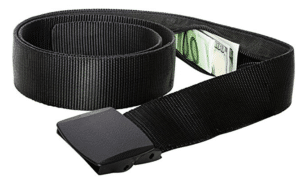 Check out the pros and cons to see if a money belt is right for you. Attached to your person. Therefore, you would have to take the wallet off to lose it. Quality varies on clip types. That is to say, if the clip comes undone, you can be in a world of panic. Depending on your body, this option can be too long. A neck wallet has all of the advantages of a purse, with less hassle. This option usually comes with a neck strap that can be thrown over the shoulder and worn underneath clothes. Neck wallets are a perfect choice for keeping identification and currency on your body, yet concealed. Read on for pros and cons of neck wallets. Actual storage area can be attached and removed from neck strap if needed. (Just be careful, this could be a con if you aren't paying attention). To access the wallet, you will need to lift your shirt. Consequently this can draw unwanted attention and expose your hiding spot. If you aren't wearing a collared shirt or turtle neck, the neck strap is visible. Travel document wallets are the best all-in-one option. This type of travel wallet is conveniently designed to carry everything from your passport and identification, to your money, to your tickets and boarding passes. With a range of sizes and compartments, travel document wallets are perfect for traveling in groups or as a family. Although handy, the travel document wallet is not suitable for an everyday wallet. Accordingly, it's size makes this option difficult to near impossible to comfortably fit in a pocket, depending upon your selection. ​Your personal considerations assist in eliminating unsuitable travel wallets. Ask yourself these things before scouring Amazon! 1. What do I need from my next travel wallet? You may think that all travel wallets serve the same purpose, but this could not be further from the truth. In actuality, travel wallets are designed differently depending on their use. For instance, are you a family of four traveling with young kids? If so, you may want to search for travel document wallets with cavernous capacity. Or, are you traveling within the United States and thereby have no need for multiple boarding passes? Perhaps a travel wallet similar to a typical men's wallet is best suited for you. Maybe you are going to an area where you do not feel comfortable leaving your identification and other documents in your hostel or hotel. If this is the case, you will definitely want to choose a travel wallet with enough space to house everything. Regardless of your needs, there is an option that fits everyone. Moreover, once you know your wants and requirements, you will have an easier time identifying viable options. 2. Where am I planning to go? What is the climate like where I am going? Does the forecast show extremely hot temperatures during your visit? If so, a travel wallet that lays against the skin may not be the best option. Is it going to be extremely cold during your visit? If so, a travel wallet that lays against the skin may offer extra warmth and protection from the elements. What season is it? The rainy season may dictate a waterproof travel wallet. What is the reputation of my destination? Is your destination notorious for pick-pocketers? If so, an on the body travel wallet is likely your best bet. Do you feel comfortable leaving your belongings in your hotel/hostel safe? If not, you will need a travel wallet big enough to accommodate your belongings in their entirety. Have you heard of electronic pickpocketing? A lot of travelers haven't. In a nutshell, it refers to the process of one person stealing another person's credit card or debit card information in a public place using RFID technology. It's a form of identity theft. A thief can carry around a scanner such as a Near Field Communication (NFC)-enabled mobile phone, stand close to people in a public venue, and tag their credit card info in seconds without the card even leaving the victim's pocket. Some travel wallet manufacturers offer a variety of RFID blocking products, like RFID wallets, RFID passport protectors, card sleeves, and more. We highly recommend at least buying an RFID card sleeve for your debit cards and credit cards even if you don't purchase an RFID wallet. Another tip is to look for ones with a money-back guarantee. 3. What Activities Will Y​ou Be Doing? Many travelers love to lounge on the beach or poolside. Your travel wallet won't be seeing much action there. But if you have plans for climbing volcanoes, cycling downhill tracks, or any other adventure activities, it can be harder to make sure your money and other valuables stay with you. If you're traveling abroad, you'll want a wallet with a good passport holder and multiple credit card slots. A leather wallet tends to last the longest. It is always better to overestimate your space needs, rather than underestimate them. Even if you don't need to carry multiple boarding passes or immigration papers, perhaps this is room you could use to carry band-aids or chapstick. Again, this aspect circles back around to what you need out of a travel wallet. With this in mind, options range from just fitting the essentials to including room for all possible documents, and some. Despite the affordability of travel wallets, not all are made the same. In all honesty, a good rule of thumb is that if it looks like it won't withstand an international trip, don't buy it. Most notably, a travel wallet should be made from fabrics and products meant to withstand general wear and tear, some water, and usage. In any case, it is essential to read reviews for any potential travel wallet. Security is a feature that comes into play more and more as technology continues to boom. In recent years, U.S. passports, credit cards, and similarly sensitive documents have come to include RFID technology. RFID stands for Radio Frequency Identification, and it generally comes in the form of a small chip ingrained within a credit card or even a passport. These chips act as a security measure, however can be interrupted when a chip is near a scanner/reader. Then, identity thieves steal confidential information by intercepting the radio waves. Thus, the added security and convenience of RFID are met with an equal and opposite threat of susceptibility from hackers and identity thieves. For this reason, manufacturers offer travel wallets with fabrics and materials designed to block the signals and any nearby scanners/readers. Although there is some debate on how great a threat there is to RFID information, it's best to play it safe. Size does matter when it comes to a passport wallet. In fact, this will likely be one of the more important considerations when purchasing your next travel wallet. While it should have enough capacity to compensate for your needs, you probably don't want a walltet that is too big. To enumerate, if you purchase a travel wallet that is too large for your needs, you run the risks of not being able to conceal the wallet, pick-pocketing, and becoming separated from your wallet. Similarly, this is another area where reading the reviews is extremely helpful, as reviewers will generally tell you if the wallet fits in a pocket or must be carried by hand. Obviously, nobody wants to break the bank when buying a travel wallet. Thus, it goes without saying that luxury options are certainly available. However, the many raving reviews and quality craftsmanship of most brands act as a testament to the adage - flashier isn't always better. There are a myriad of options available that are not only affordable, but efficient and practical. Even though you do not want to sacrifice quality for price, you also do not want to fall prey to keeping up with the Jones'. In most situations, you get what you pay for. If you purchase a poorly-made travel passport wallet, just because it costs less, you'll find it doesn't do the job. You end up losing more than you bargained for. Generally speaking, you want to find some high-quality products in the mid cost range. You don't need to break the bank but you don't want to skimp too much either. Do you need a travel wallet or passport for multiple passports or more than one set of travel docs? If so, then you need to get a travel wallet with extra room. This goes hand in hand with durability. While some people like cloth, we highly recommend leather material for durability or at the very least, a strong water resistant material. There's also anti-slash material, but you will have to pay more upfront for it. You're going to want a wallet that can keep up with you. When you're traveling, you're probably bringing a few different types of cards. You will need slots for your debit card, credit card, ID, and bus or train pass. It's also useful to have another one for electronic hotel room key card. You're probably going to keep your travel documents, boarding pass, and passport here too. More compartments equal more opportunities for organization. Zip closure and a zippered pocket are great for keeping receipts and ticket stubs. Last but not least iPhone travel compatible wallets are great too. Some come with a keychain like clip so you can't lose your phone. The design allows the product to remain in close proximity to the person wearing it, thereby making pick-pocketing difficult. RFID-blocking technology is incorporated into the fabric, offering security without bulking up the belt. The 210D rip-stop nylon is water resistant, durable, and breathable. Reviewers note a crinkling noise in the material. This could potentially draw attention to your money stash. Carrying a phone, keys, wallet, and multiple travel docs can make the belt bulky or heavy. 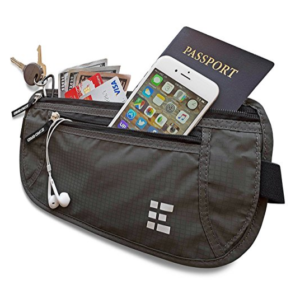 The Zero Grid Hidden Money Belt is one of the premier options for travel wallets of this style. The unisex travel wallet is available in colors: Ash, Desert Sand, Midnight, and Shadow Grey, ensuring a preferred color choice for travelers of all types. The 210D Rip-stop nylon is water resistant, featuring a moisture wicking layer where the wallet meets skin. Nonetheless, Zero Grid's product is breathable and sleek. That being said, comfort is not an issue, as the adjustable, elastic waist strap fits waistlines up to 46". This means, that not only will you be comfortable walking around with the Zero Grid money belt, sitting will be a restful experience as well. For those concerned with security, Zero Grid designed the product with RFID blocking materials on both the front and back of the travel wallet. Thereby, the integrated security layer promises protection without making the wallet bulky and noticeable. Finally, Zero Grid's product is also spacious. There are two quick access zippered pockets for items you frequently use. Phones, wallets, keys, passports, documents, gum, and the likes all comfortably fit within the pouches. In addition, inner nylon pockets hold valuable identification, as well as any other items you wish to conceal. Reviewers attest that Zero Grid's money belt is perfect for carrying all of your travel essentials. The one downside commonly noted though, is that the belt's material can make a crinkling sound, possibly drawing attention. Nonetheless, the belt is relatively comfortable and useful. The interior is cavernous. See how much you can fit inside the neck wallet and let us know in the comments! The long, flat design makes the product lay against the skin/clothing and is discreet. Carrying the bag on your person lessens the likelihood of pick-pocketing. RFID-blocking technology is incorporated into two separate layers of the wallet. The 210D ripstop nylon is water resistant, durable, and breathable. The many pockets keep all of your documents and belongings organized. Reviewers report some discomfort with the strap. When fully loaded, the neck wallet can become heavy, causing the strap to pull on travelers. Some reviewers were displeased with the size of the bag, stating that it was too large. The product does not have much give/flexibility and is rather stiff. If you like minimalist travel products, this is the wallet for you. 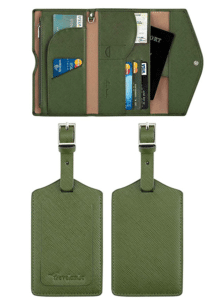 Winks Travel creates an awesome product within the neck passport wallets category. The unisex design comes in Mercury grey, night sky black, and tropical sunset pink. With such great colors, you'll be disappointed that the wallet is worn underneath clothing. Winks' Travel neck wallet is made with 210D rip-stop nylon. The durable and water resistant material is sure to stand the test of time and travel. Water resistant and breathable, the back panel of the neck wallet is complete with wicking mesh backing. Likewise, this product features two layers of RFID blocking material, doubling up on the standard single layer that competitors often tout. As the RFID blocking technology is incorporated into the bag, travelers won't notice that Winks is actively ensuring your security. Equally important, the large capacity allows all of your necessities to fit comfortably. On the other hand, the streamlined design lays discreetly under clothing, even when loaded to the brim. 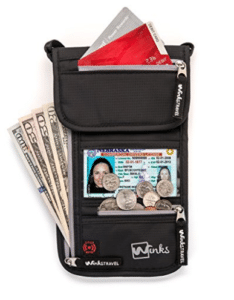 With seven pockets, Winks claims that these neck wallets can fit money, coins, credit cards, up to 4 passports, a driver's license, a smart phone, room key, boarding pass, itinerary, travel brochure, band aids, medications, sanitizer, chap-stick, tissue, safety pins, gum/mints, car keys, headphones, pens, and more. Although the product features a "Tough" shoulder strap, the rest of the wallet is soft on the skin. Easy glide zippers ensure easy entry to the wallet. Reviewers loved that the neck wallet was easy to conceal under clothing, minimizing the risk of thieves. Even still, the bag is a bit stiff. Spacious interior allows for organization of multiple documents and identification for multiple people. The travel wallet opens like a book, making access easy. RFID-technology is built into the product. The high-density fabric is durable and waterproof. The wrist-strap allows travelers to keep a tight grip on the travel wallet. Great for traveling as a family or group, as well as navigating the airport. Reviews note that this travel wallet is a bit large. Therefore, it is not suitable for everyday use. Don't count on being able to tuck this travel wallet in your back pocket. Becoming separated from this wallet is a risk, of course, because it is not firmly attached to your person. Zoppen's travel document wallet is a top choice for those who need an all-in-one travel wallet. Available in black, army green, pink yarrow, and royal blue, the unisex design is suitable for anyone and everyone. Zoppen's product features a waterproof, high-density nylon fabric. In a like manner, the stone-wash trim gives travelers the most secure grip on the clutch. To further assist in this, a removable wrist strap and key chain are included. An external cellphone bag and ticket compartment also complete the set. Zoppen has created a spacious product. 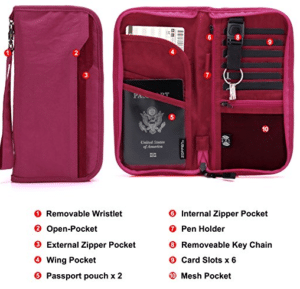 In fact, this travel document wallet can hold up to two passports, boarding passes, credit cards, a checkbook, an identification card, a driver's license, tickets, shipping documents, a key, cash, coins, a phone, a SIM card, and a pen. The travel document wallet works those traveling as a group or a family. The designated carrier can easily sift through organized tickets, documents, passports in more. From here on out, this travel wallet will alleviate all tension associated with traveling. Reviewers were impressed with the capacity of the travel document wallet, but felt dismayed at the large size. This is a great passport travel wallet. Keep all your travel essentials in one place with this stylish travel document holder from Ted Baker. The statement Chelsea border patterned cover features the words 'fly me to the Moon' in rose gold lettering, and the pink, faux-leather interior includes space for your passport, documents, travel tickets and a plastic ID window. Your documents are kept safe and secure with the bow shaped popper closure, and completing the travel accessory is a rose gold pen fitted neatly inside with the words 'take flight' on the barrel. It's not a leather travel wallet. This wallet is definitely geared more towards style than practicality. While it's a great choice for an accessory, we highly recommend keeping it away from the elements. The material is in no way meant to be durable. 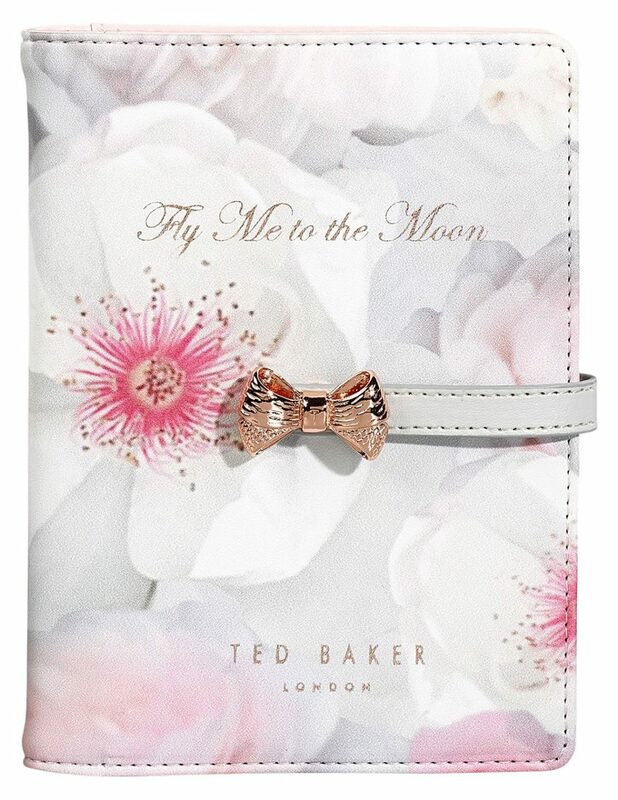 Like we said, the Ted Baker Travel Document & Passport Holder is all about style. With this said, it doesn't offer protection against RFID either. We added it to the list to give you fashionistas a little more variety. We do highly recommend purchasing an RFID sleeve for your credit and debit cards though. Don't carry them loose. This travel and passport holder is designed to hold the cards and documents of one to two travelers. If you try to fit any more than that, the lock won't shut. Need help choosing your other travel accessories? Here at trekbible, we've got you covered! 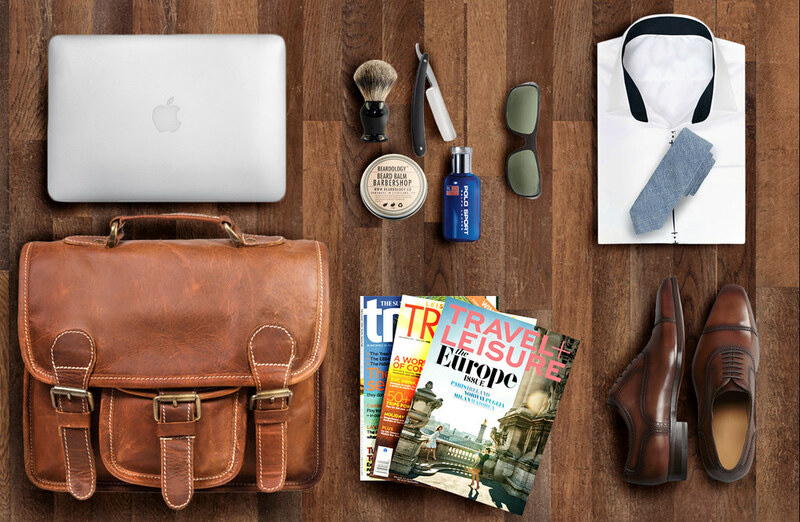 Check out these articles for our favorite travel products. For anyone with frequent flier miles or plans for international travel, a travel wallet is a must. With a wide variety of options, styles, and features, there is a product available for everyone. Once travelers first determine what they need from a travel wallet and where they plan to go, capacity, craftsmanship, security, size, and price are all important to consider. Although our three favorite travel wallets are a money belt, neck wallet, and travel document wallet, there are travel wallets designed to suit any need. Don't fumble with your travel documents and money ever again! A travel wallet can solve all your problems. Let us know your favorite type of travel wallet in the comments. Additionally, if you have a favorite product, be sure to share that as well! On top of her day job, Kelsey is an academic, artist, blogger, and aspiring stay-at-home dog mom (a girl can dream, right?!). 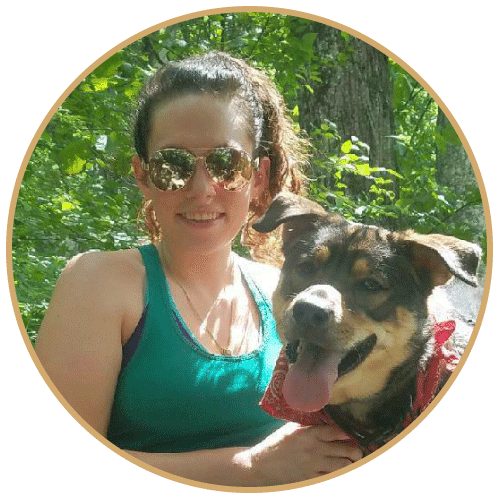 As a nomad, Kelsey enjoys spontaneous adventures and following wandering trails. Although she is up for anything, her favorite treks are local mountain and waterfall excursions.